White Rose home care is a full - service team of home care professionals working together to provide In - Home services that are client- centered. We aim to keep the Family in the Family by catering to varied needs. We continuously seek to promote your ability to remain independent and exercise free choice by customizing our services to meet your daily needs required to stay independent within the community. We are dedicated to keeping you in the comfort of your home. Our Mission is to provide our clients and families with high quality client centered services in the comfort of their home. Quality service is our top priority as we seek to ensure a safe, comfortable & healthy way of life. We ensure all needs of the client is met daily as we strongly believe in providing services with Pride & Dignity! White Rose Home Healthcare Agency Services offers in home care that is designed to meet the needs of you and your loved one. We provide services to the elderly, disabled and individuals with short and long term illnesses. Effectiveness - White Rose Home Healthcare Agency aim to provide care and achieve outcomes that are supported by research data. We will seek to gather measurable progress towards clients goals and improvement of client's condition. Efficiency - White Rose Home Healthcare Agency will ensure that the level of care is reasonable and cost effective. 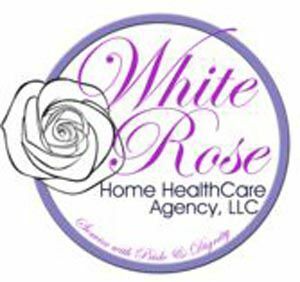 Patient Centeredness - White Rose Home Healthcare Agency will always put the needs of the client first. We will educate the client on the care receiving and will allow client and family to personalize care plans. Safety - White Rose Home Healthcare Agency will ensure the safety of the client is top priority. We will ensure that all elopement risk are examined to prevent unsafe issues. I want to thank Sofia at The White Rose Agency. She was truly an Angel sent from up above to take care of our father, who has dementia. The staff also are very nice! Again, special txs & love to Sofia.